19.5'' high, 13'' tapering to 11'' at the top wide, and 7'' thick. 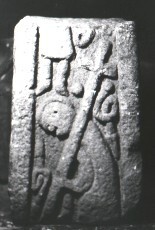 Cross Shaft fragment, known as The Calvary Stone. The main face of the stone has a draped figure holding a short-armed cross in his left hand and over his shoulder. He may have a nimbus. There are serpentine shapes carved on either side of the shaft of the cross, and part of a serpent under the left arm of the main figure. This may represent Christ carrying the cross to Calvary. Above this figure's head there is the lower part of the body of another figure. There is a disc or pellet carved in relief near his left foot. Pape, T., The Round-Shafted Pre-Norman Crosses of the North Staffordshire Area (repr from Transactions of the North Staffs Field Club, 1945-46) 1st, , Stoke-on-Trent (1946-47) Crosses, Anglo-Saxons, England..